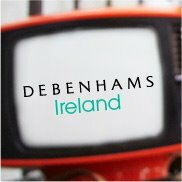 Debenhams – the well known department store have a few stores in Ireland – but you can save yourself a journey and shop online at the Debenhams Irish website. Debenhams sell a massive range of products from designer clothes, furniture, rugs, toys , perfume , skincare , make-up ,jewellery, watches, bedding, curtains, table linen , glassware , cookery equipment and utensils – a one stop shop for almost everything! Designers at Debenhams include : Ted Baker, Jeff Banks, Jasper Conran, Betty Jackson, Jonathan Kelsey, Ben de Lisi, Julien Macdonald, Melissa Odabash, Jane Packer, Pearce Fionda, Preen, Janet Reger, John Rocha. Maine New England , Mantaray , Pineapple , Principles , Radley , Red Herring , Converse , DKNY , Faith , Finesse , Fiorelli , Floozie , Fossil , French Connection , Freya , Gionni , Jon Richard , Killah , Lipsy , Nine West , Jenny Packham , Pilgrim , Reebok , Swesky , Van Peterson Vicenza.